The Calgary Bridge Foundation for Youth (CBFY) is a charitable not for profit organization that originated in the year 1990, serving over 13,800 individuals annually. For over 27 years CBFY provides a welcoming and inclusive environment for immigrant and refugee youth and their families by enriching them with the appropriate information, knowledge and experience as they build a life in Canada. Our core values are, to create a sense of belonging, be ethical and respectful in our pursuit of excellence, strengthen our relevance through collaborative partnerships and positive synergies, champion diversity as our core ethos, nurture growth and innovative practices and inspire a culture of excellence. CBFY believes in nurturing healthy partnerships with core partners, the Calgary Board of Education, Calgary Catholic School District, The Calgary Public Library, and immigrant sector partners. 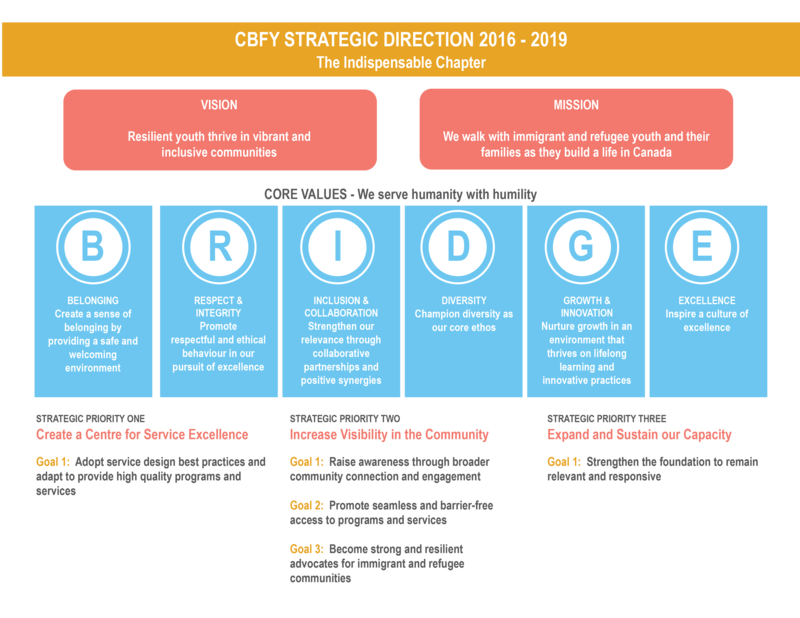 The unique selling position of CBFY is its community-led and collective impact model, vast array of programs and services that serve as a continuum for holistic and cross-sectional youth development and talented, diverse and multilingual staff that tirelessly serve “humanity with humility” and develop “resilient youth who will thrive in vibrant and inclusive communities”.